The refurbished gym at Padiham Leisure Centre has been officially opened. 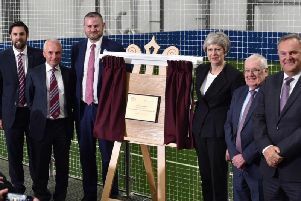 The new-look gym was refurbished with financial support from Burnley Council – money which has been spent on new state-of-the-art equipment. New equipment has been installed at the leisure centre and now members have access to the latest training technology available. Scott Bryce, Burnley Leisure’s operations manager, said: “The new equipment at Padiham Leisure Centre is outstanding and integrated with the very latest technology and workout programmes to ensure our members have that ultimate experience. “We are over the moon that we have also been able to install a new cycle studio to the facility at Padiham with pioneering design of the latest indoor cycling bikes; coincided with an immersive MyRide experience. For more information call 01282 477222/664444 or visit www.burnleyleisure.co.uk/memberships.